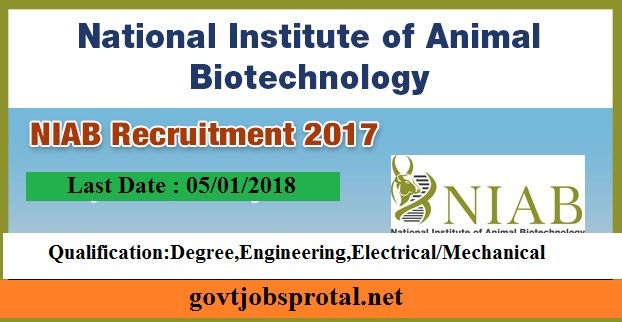 NIAB invites applications from suitably qualified, dynamic, result oriented and dedicated Indian citizens for filling up the following positions Ministry of Science & Technology, Government of India, is aimed to harness novel and emerging biotechnologies and create knowledge in the cutting edge areas for improving animal health and productivity. b). Pay Scale : (7th CPC) (PB:2 GP 4,600/- prerevised) on direct recruitment basis. c).Qualifications: Graduate with 50 % marks from a recognised University and more than 10 years of service in Defence/para-military forces. b).Pay Scale:-(7th CPC) (PB:2 GP 4,600/- pre-revised) on direct recruitment basis. Graduate with post-Graduate diploma in HRD/Personnel Management /Finance or Post graduate degree in management/finance from a recognized Institute /University with 5 years of experience in Administration/ Establishment/ Accounts/ Stores/Purchase in a Govt. Organization of repute. b).Pay Scale: (7th CPC) (PB:2 GP 4,200/- pre-revised) on direct recruitment basis. Bachelor Degree in Library Science /Documentation or its equivalent grade with minimum of 50 % marks from any recognised University/Institute with minimum of 3 years of experience in Library/informatics works in any Library of a reputed Organization with excellent communication skills in Hindi & English. 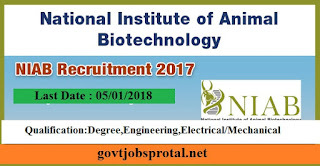 c).The post to the Senior Manager, National Institute of Animal Biotechnology, D No. 1-121/1, 4th and 5th Floors, Axis Clinicals Building, Miyapur, Hyderabad, Telangana, India - 500 049 on or before the prescribed last date. Last Date Submitting of Online application. 01/01/2018. Last Date for receipt of printout of Application.05/01/2018.